Will There Be A City Of Ember 2? If you're a fan of the underground world of young adult scifi that is Jeanne Duprau's City Of Ember, then you're aware there's a sequel to this novel called The People of Sparks. So in a press conference for the movie adaptation Bill Murray, Tim Robbins and Saoirse Ronan answered who might be coming back, and what were the chances for an Ember 2. And Murray has a very complicated scientific explanation of his character's future. Spoilers for the film below.In the end of Ember the corrupt Mayor met a grisly demise by way of giant tentacle-faced mole. But Murray insists this is not the last you'll see of him, based on science. But both Tim Robbins' and Saoirse Ronan's characters are in the novel sequel, so you'll probably see their dirt streaked cheeks again. Do you think it may be possible to bring your characters back for other films, I know Bill you're eaten by a mole.... Bill Murray: I may have been injured by the mole. I see myself in a sling in the sequel. 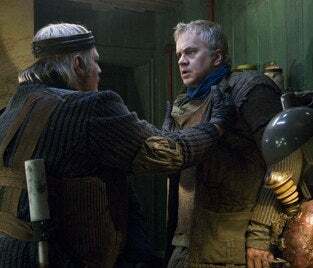 Tim Robbins: I think when you are eaten by a mole, that it doesn't really digest you. Bill Murray: You become regurgitated. Robbins: So yeah, that's the scientific explanation. Murray: They are aerobic, they're not anaerobic, so you are even able to breathe within the digestive tract, and procreate. Robbins: Apparently, both characters are in the next book. Saoirse Ronan: I haven't read the second book, but I don't think you're in it [to Murray]. Murray: [Laughs] My people. Ronan: I asked Gil [Kenan the director] when we were on set whether we were going to do a sequel or not and he said, "Get all of your friends to go and see it and then we'll see." I think it's basically how this one goes and then we'll see. But you would do it? Ronan: Yeah, if Gil was still going to do it and we still had all of the cast, then yes.